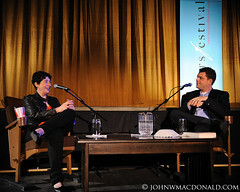 Joanne Harris in Ottawa promoting her newest novel "blueyedboy". Here she is on stage having an entirely pleasant conversation with host and artistic director of the Ottawa International Writers Festival, Sean Wilson. A fun site, I liked her QAF page www.joanne-harris.co.uk/v3site/qaf/index.html where she poses the question, "So – how well do you think you know me?" and the humorous section "Common clichés and how to avoid them!". Tuesday - Saturday, from 1:00 PM until 6 PM.